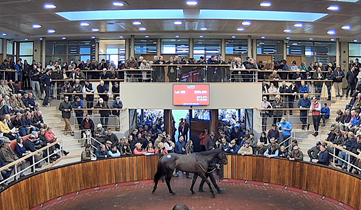 The annual Million in Mind Dispersal, coupled with the Select Point-to-Point and Bumper Session, proved every bit the highlight it promised to be at the Goffs UK Spring HIT Sale. Offering a select number of horses on the opening day of the two-day Spring HIT Sale, including the Million in Mind draft and recent Point-to-Point winners, and general HIT dispersals from the UK and Ireland’s leading owners and trainers on Day 2, the sale produced significant rises in statistics across the board. Anthony Bromley and David Minton’s Million In Mind draft headlined proceedings and produced the sale’s top prices with the Grade 2 winner and Grade 1 placed Le Prezien (Lot 305 pictured) selling to Frank Berry on behalf of J.P. McManus for £290,000. Just one lot earlier, Berry went to £260,000 to secure Million In Mind’s Listed winning mare The Organist (Lot 304), also on behalf of J.P. McManus. The Select Supplementary Session, which featured current Point-to-Point and Bumper winners, also saw its share of fireworks and was topped by Espoir de Teillee (Lot 351) who created a huge impression on his debut at Athlacca earlier this month. The four-year-old equalled the sale’s top price last year when selling to Roger Brookhouse for £220,000. The Select Session saw three additional horses sell for over £100,000 with Milestone Stables’ Minella Warrior (Lot 355) selling to Jill Lamb Bloodstock for £180,000, Monbeg Stables’ Calino d'Airy (Lot 353) purchased by Harold Kirk and Willie Mullins for £150,000 and Newlands Farm Stables’ Ravenhill Road (Lot 363) selling outside the ring to Phil Martin for £100,000. "The Doncaster Spring Sale has proved to be the ultimate NH sale for many, many years as it uniquely combines top class NH stores with classy horses with form. "However it is fair to say that it appeared to have lost some its allure in recent years as the market evolved and, frankly, perhaps we were a little slow to react. But that is very much in the past now as the last three days have returned a proper trade for each category as we have found a format that plays to each sector’s strengths and gives the time and space for vendors and purchasers alike to focus on the very distinct sections of the sale without losing the enduring appeal of Doncaster in May. "The store trade made significant advances on day 1 enjoying a vibrant trade from start to finish that saw all the key statistics advance with the average growing by 20%, the median jumping 33%, joint top lots of £105,000 and a mighty clearance rate of 82%. "The second short day was designed to give maximum time for buyers to concentrate on both the Million In Mind Dispersal and the recent form of a really strong bunch of Point-To-Pointers. As ever Million In Mind proved a genuine highlight and we are indebted to Anthony Bromley and David Minton for trusting us with their sale every May. It is a source of some considerable pride that we have handled every Million In Mind Dispersal since the start and we were so pleased to deliver another set of stunning results led by the sale toppers at £290,000 and £260,000; once again JP McManus has made a real difference and we are no less grateful to him and every other bidder. "At the same time the Point-To-Pointers were an equal highlight and we extend our heartfelt thanks to every vendor for giving us the chance to re-establish Doncaster In May as a leading sale for the category. Rarely has a sale ring been as full as yesterday as the NH fraternity flocked to Doncaster for real quality at every level. "Today’s sale has continued the vibrant theme with a really strong day featuring the annual dispersals from so many leading NH stables. They too have been rewarded with a diverse buying bench leading to strong results to vindicate their choice of sale venue."